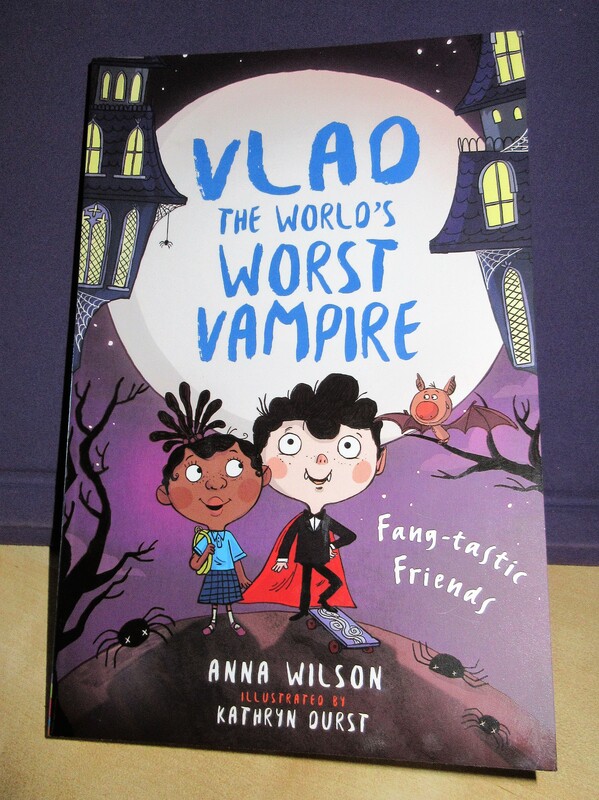 Eva received Fang-Tastic Friends, the second in the Vlad The World’s Worst Vampire series this week. Written by Anna Wilson, Illustrated by Kathryn Durst and published by Little Tiger, Fang-Tastic Friends is a great sequel which Eva loved. This hilarious and charmingly illustrated paperback for kids is just £5.99. Vlad is back on another Fang-tastic journey full of hysterical yet relatable moments giving a comical twist to common issues children face. Vlad’s main focus is making friends and fitting in at human school. Vlad’s parents take a trip to Transylvania, leaving him with Grandpa Gory giving Vlad a chance to sneak off to human school. There’s a catch though, whilst Vlad stays with Grandpa Gory he has to complete, and master a list of vampire challenges to impress his parents with or there’ll be trouble! Eva couldn’t wait to sink her teeth into this Fang-tastic sequel and join Vlad and his Fang-Tastic Friends. In fact, she was so excited she ended up reading the book in one sitting, sneakily staying awake until gone 9 pm! Having really enjoyed Vlad The Worlds Worst Vampire, which she regularly re-reads I wasn’t too surprised Eva had become so engrossed in the story. I was very much the same at her age. Vlad is worried he won’t make any Fang-Tastic friends at human school but he soon makes friends with Minxie. Minxie quickly finds out Vlad is a vampire but she keeps his secret. Continuing to practice his vampire challenges, Vlad feels stressed that he can’t get the hang of mind-control. Vlad feels like he can’t master mind-control, even trying to call Flit his pet bat, doesn’t work. That is, until Boz a school bully keeps bothering Vlad & Minxie. Wishing the class tadpoles would leap out of their tank and on to Boz the bullies head seems to work at least! Eva found this hilarious! She found it even funnier when Vlad pictures Boz tripping, flying into the bike shed & Boz being covered in spiders, works too. Vlad is worried though as his mind-control only seems to work on Boz!! Eva says she can’t wait to see what happens next and is totally hooked on this series. She hopes it isn’t too long until Fang-tastic Friends is followed by a third book in the series. Fang-Tastic Friends is fantastic, even I got a bit engrossed flicking through the book. This is definitely a series full of humour and issues children and young vampires face. 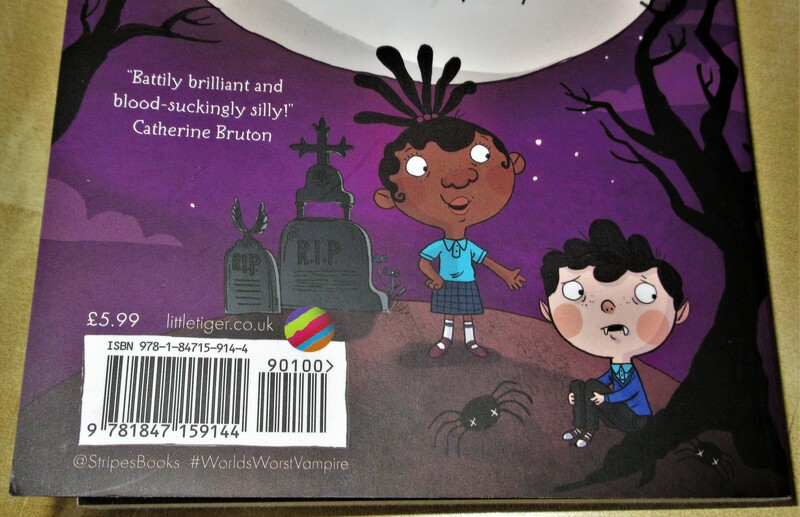 We can’t wait to read more about Vlad and his Fang-tastic Friends. Do you love the sound of Fang-tastic Friends too? Have you read the first book yet? Eva has been reading Vlad The World’s Worst Vampire this week. 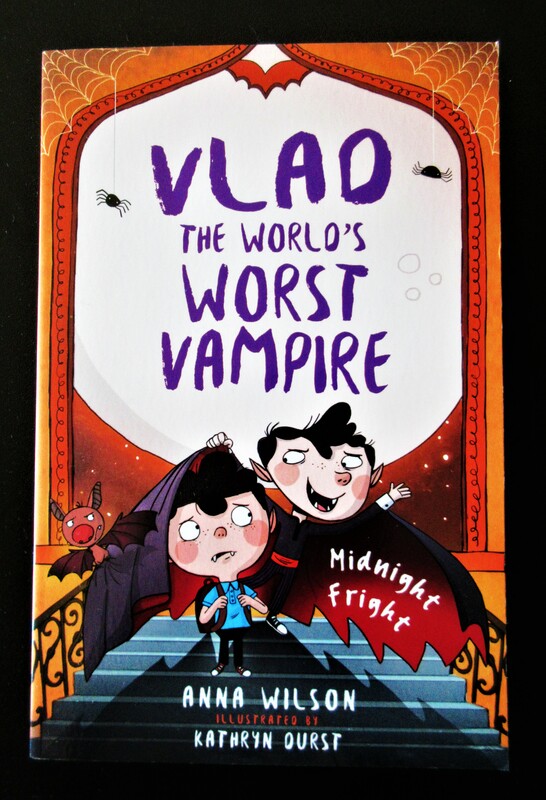 Written by Anna Wilson and illustrated by Kathryn Durst, Vlad The World’s Worst Vampire is available in paperback for (RRP) £5.99 and perfect for 7-9 year olds. The first book of a brand-new illustrated series, featuring fangtastic characters & batty humour, Vlad tries to find where he belongs. We recently discovered books published by Stripes in the library, Stripes is an imprint of Little Tiger Group, our favourite publisher! Eva decided she wants to work her way through books published by Stripes. I have to admit they seem rather funny and quirky, perfect for her. Seeing Eva so excited about reading is fantastic and she was ecstatic to receive Vlad The World’s Worst Vampire. Vlad is the youngest member of the Impaler family, the bravest vampires ever! Vlad isn’t that brave though, he’s even scared of the dark, much to his parents disappointment. Wanting to make friends Vlad decides Human school is the best place to make friends. With his pet bat Flit Vlad heads off to Human school in search of friendships, trying his best to keep his true identity a secret! From the very first page you can tell this will be a hilarious book to sink your teeth into. Anna Wilsons fantastic humour makes this book the perfect read! We will definitely be keeping an eye out for the rest of the series as they are published. I liked Vlad the worlds worst vampire because he pretended to be a human but was actually a vampire! He pretended to be a human because he wanted to go to human school. After reading about Jollywood academy – The best school in the world, Vlad decides he prefers the sound human school. His family isn’t too happy about it though! It is such a funny book to read.